Posted on 09/02/2009 Are You Suffering From a Head Injury? When you’re in the midst of filing an Iowa workers’ compensation claim with your Des Moines workers’ comp attorney, initially, you probably won’t be aware of all the little things that could thwart your case. It’s important to talk with your lawyer, make sure you’re following the rules and requirements, and avoid these small mistakes that could ruin your chances for compensation. Your work accident has probably made a mess out of your life, and it can be hard to stay on top of everything that needs to be done, especially when you’re under an enormous amount of stress and dealing with an injury. Keep an accident file (containing all your papers, appointments, records, etc.). 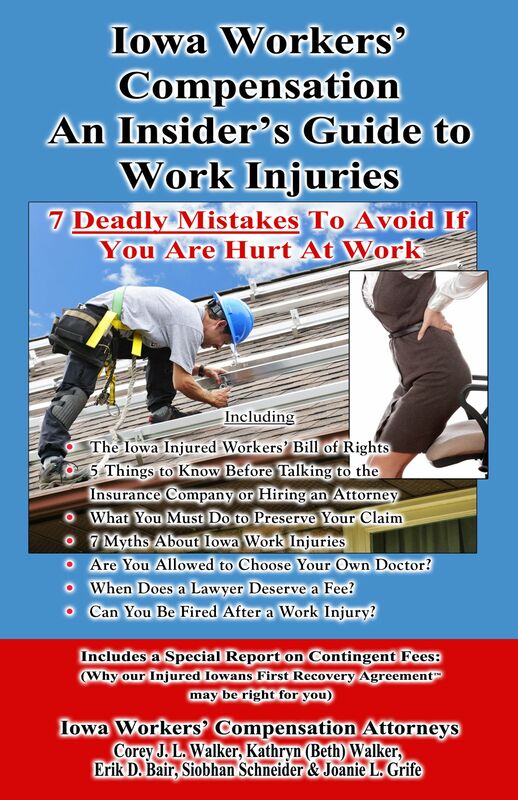 Religiously adhere to all the Iowa workers’ compensation laws. Two common mistakes to avoid are rescheduling doctor appointments and throwing away paperwork you assume your lawyer already has a copy of. Rescheduling doctors’ appointments will not only stall your case, but the insurance company could use diversions to prove that your injury isn’t serious. Throwing away paperwork that you assume your lawyer already has is an assumption you cannot make. Keep hard copies of everything because you never know when you’ll need it again for your case. Your lawyer has probably already counseled you to avoid talking about your case on social media sites, but there are probably a few things that you think are harmless that could actually throw a monkey wrench into your claim. For instance, there are a couple of innocent mistakes you might make when you’re in the middle of filing Iowa workers’ compensation claims like posting pictures or not changing your privacy settings. Posting old pictures on Facebook or Instagram of you water skiing on Saylorville Lake or snowboarding at Seven Oaks can ruin your credibility. Even when the pictures were taken before your injury, if they’re posted after the accident, they could still be used against you. By not double-checking your privacy settings you can hurt your claim, too. If you still insist on using social media during your claim process, make sure to set your privacy settings to “personal” or “private” so that only select friends can view them. However, insurance adjusters may still find a way around this, so continue to exercise caution. If you have questions about whether or not your online activity is safe, contact a Des Moines workers’ comp attorney.